Home » Introducing Bison Wet Weather Gear from New Zealand. We here at Hip Pocket are always looking for new and different Brands to bring new innovative products to you. Introducing BISON - Rainwear from New Zealand. When you choose Bison Rainwear you will notice the difference - not just because of all of our safety features, but perhaps primarily because it draws a line between those who have them and those who don’t. We have put BISON through years of testing in a range of environments and conditions. This includes subjecting them to the demands of extensive testing within a large variety of industries. BISON is focused on producing safe yet attractive rainwear. We do this by keeping at the cutting-edge of new technology in safety to produce rainwear with the safety features you need. Different industries and professions have different requirements for the materials used in their work day. We work with manufacturers worldwide to create the materials that meet these tough demands. Safe, functional and comfortable, with an attractive design. That’s the result of expertise and collaboration with users. We have an entire department dedicated to producing innovative footwear and rainwear to stay at the fore-front of your industry. 5 in 1 Combo Jacket and Vest. You can’t go past this top quality combo with the Bison 5-IN-1 PLUS! The Bison Stamina vest is reversable with an anti-pill polyfleeece lining, has zip off sleeves and zips into the Bison Stamina jacket. With 5-IN-1 PLUS you can choose the option that best suits your day to day needs! 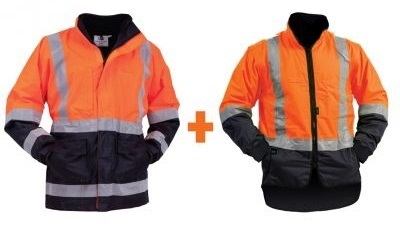 The PLUS part of this combo is that it comes with the added benefits of meeting AS/NZS 4602.1:2011 and AS/NZS 1906.4:2010 standards, has breathability to 2000g, is waterproof to 3000mm and uses UltraFlect® reflective tape. 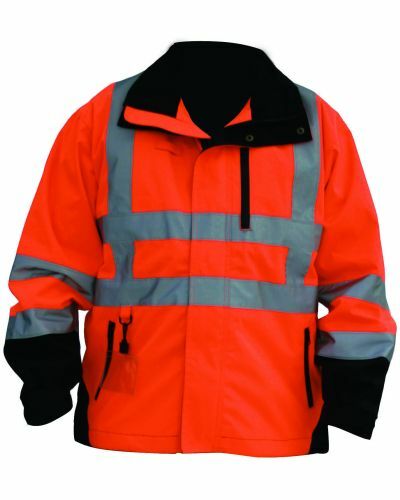 High visibility in accordance with: AS/NZS 4602.1:2011 Day/Night use. EN471 - Class 3. Ask your Local Rep to see the full range now available! High visibility in accordance with: AS/NZS 4602.1999 Day/Night use. EN471 – Class 3. Material complies with: AS/NZS 1906.4.1997. Suitable for Day/Night time usage.